I hope this marks a return that is permanent, and that all the medical issues that have kept me chasing my tail for the last few months have been settled. I have been a fan of jellyfish ever since I learned that they were neither jelly nor fish. I would love to be able to find a local environment that had some of the fresh-water medusae; I think they would be really crazy things to see. There are a lot of short movies on the web showing some impressive medusae. Here is one of the nicer ones that has popped up lately. I remember pretty vividly not seeing the largest medusa I encountered. 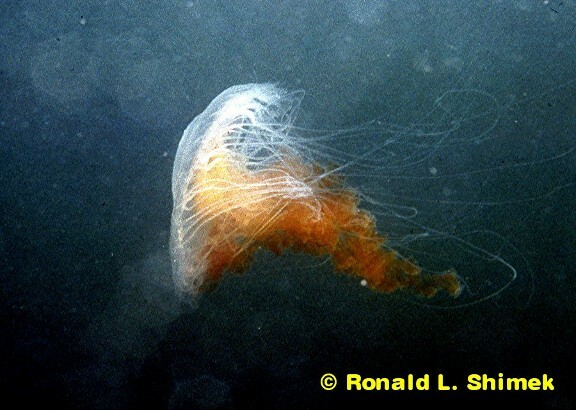 It was a lion’s mane jelly, Cyanea capillata. Lion’s Mane Jelly fish, Cyanea capillata. This individual was about 1 m in diameter. The tentacles from this medusa could easily extend 15 m (50 feet). Although these medusa are less impressive looking than the one in the video, Cyanea get much bigger, and supposedly are the largest medusae. 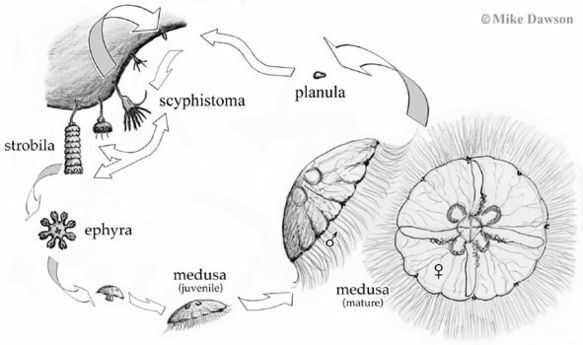 They pack a rather nasty zing in their nematocysts. I was wearing a drysuit that had good protection around the face, but my diving partner was less well protected. Technically I was his partner as he was taking the lead on this particular dive. 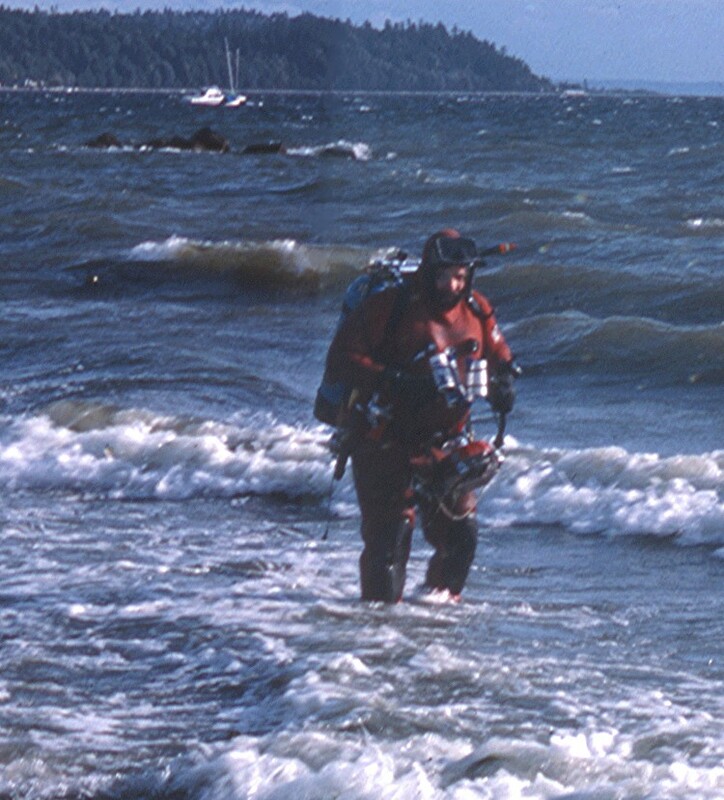 We were diving in deep water in Saanich Inlet, a British Columbia fjord, to collect some tunicates that he was studying. Anyway, we were down at about 25m (82.5 ft) depth and the visibility was kind of surreal. There was a plankton bloom in shallow water, so if we looked upward, all that was visible was a green haze. We were swimming near a rock cliff when all of a sudden ahead of us in the water we saw a series of thin, dark red and orange threads running vertically. These were the tentacles of the medusa which was probably 15 m or more above us. We immediately stopped moving, but it didn’t, and the tentacles swept over us. They didn’t bother me at all, but they wrapped around my partner’s mask hitting his bare skin, and I could see by his response that this anything but pleasant. I saw him write something on his underwater slate we used to take notes, and we continued our dive. After the dive, I found out he was recording what the stings felt like. We never saw the body of the medusa, but individuals of this species gets huge, examples over 2 m (6.6 ft) in diameter have been recorded. A while later, we finished our specimen collection and headed back to our boat. Once in the boat he got his gear off and rinsed his face with fresh sea water to clean off the remaining tentacles. Then we used a paste of meat tenderizer (kept in our emergency kit) to remove the remaining tentacles and nematocysts. At the time, the folk remedy in vogue or old diving wive’s tale, take your pick, was that meat tenderizer would remove the nematocysts. He said he couldn’t tell if it made any difference or not. He recorded effects of getting stung (severe “electric shock” types of pain “hits”) for the next several hours. Eventually, about 10 hours after getting stung he said the immediate effects seemed to stop. He had some very picturesque welts around his forehead and cheeks, which faded away over the next day or so. Medusae are budded off polyps and are uncommon in reef aquaria, although small ones swimming the water column have been documented. 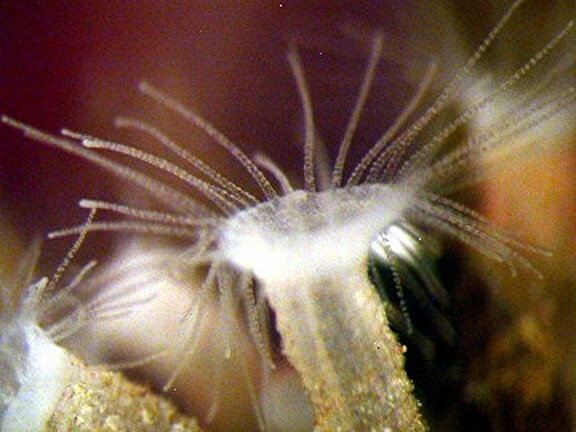 Tiny, non-swimming, hydromedusae, on the other hand, may be very common crawling on the walls of some reef tanks. These little critters look like tiny snowflakes on the glass, but one needs a hand lens of about 10x – 30x (or a dissecting microscope) to see any detail. Hydrozoan jellyfish Staurocladia oahuensis on the side of an aquarium. Animal is about 2 mm in diameter. Some polyps that bud off scyphozoan medusa can become quite common in some reef tanks. 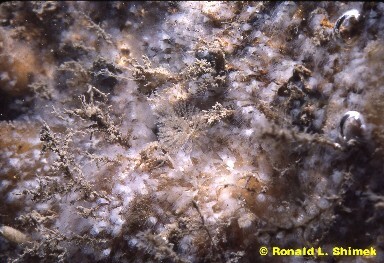 The most common of these are polyps of the coronate medusa, Nausithoe. The polyp masses commonly reach the size of a golf ball, and if they are not disturbed they can become quite a bit larger. The polyps from these clumps produce can produce quite nasty stings. So, if you have some in one of your tanks, you might want to follow the example of my friend and document your reactions to being caressed by the gentle kiss of the tentacles. The medusa have not been found in my tank, but some of them are quite attractive. Nausithoe sp. 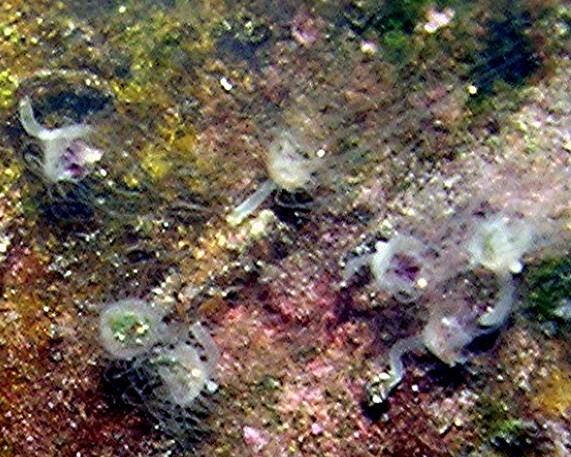 polyps; the many small tentacles and the symmetry of fours in the disk are characteristic of this polyp. 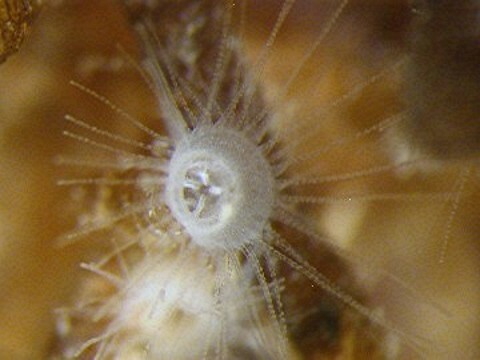 Coronate medusa, Nausithoe polyps. 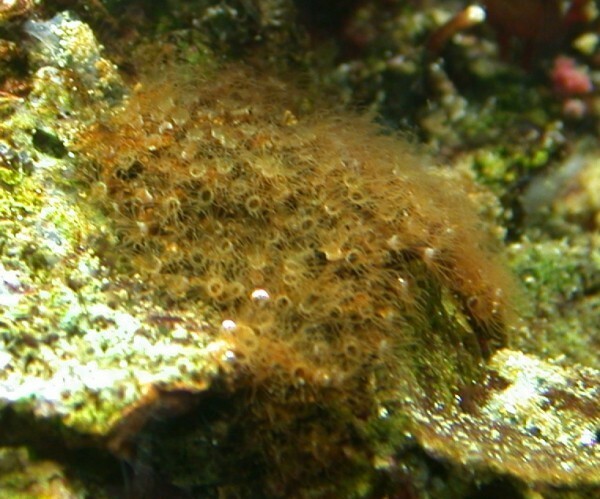 The brownish color is characteristic of these polyps. 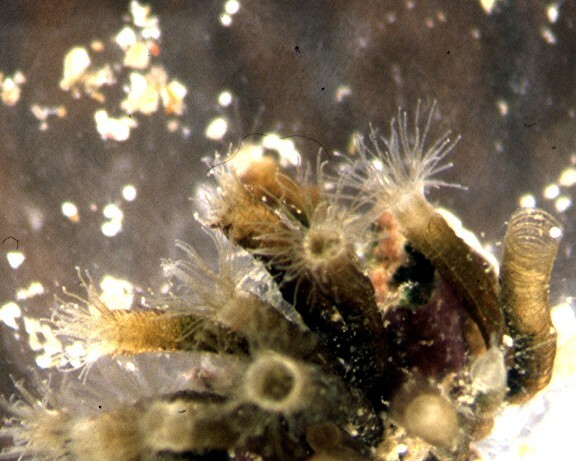 Nausithoe polyp colony showing the typical form. 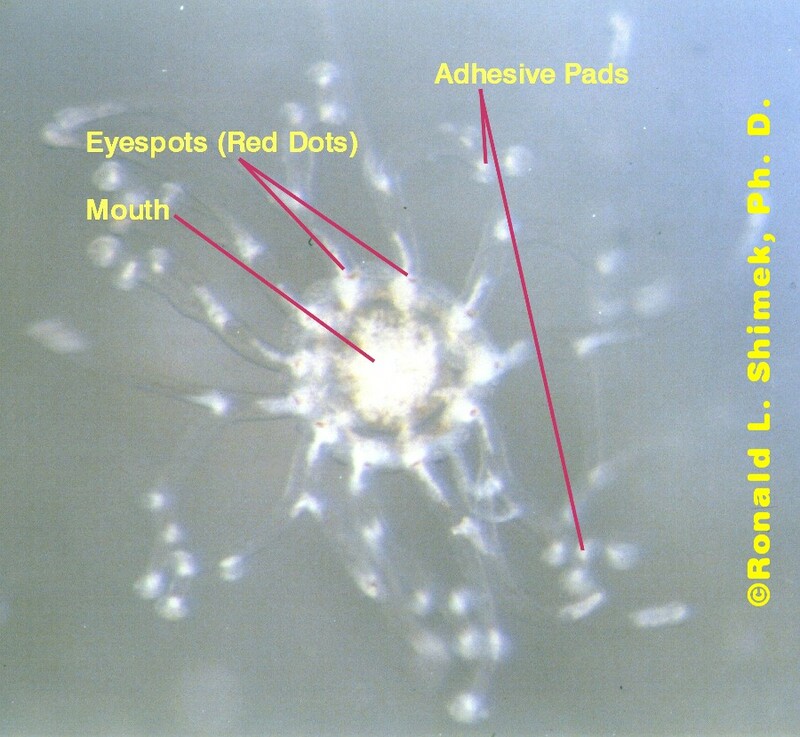 Each polyp is about 2 to 3 mm. in diameter. Over the years, I have had the polyps of some other scyphozoans show up in my tank, these polyps are referred to as scyphistomae, and they have a relatively distinctive architecture, tending to have very long tentacles and a “saggy” appearing column. The polyps feed and grow, and when “the time is right” they strobilize, or slice themselves in stacks of “larval” jelly fish which get budded off and swim away to grow up and produce the adults. Unfortunately, while I have never seen the small larval forms visible in my tank, they could have been present. The larvae are quite distinctive, looking like a small mobile asterisk. They feed and grow up into adults which are sexual and which reproduce by the use of eggs and sperm. 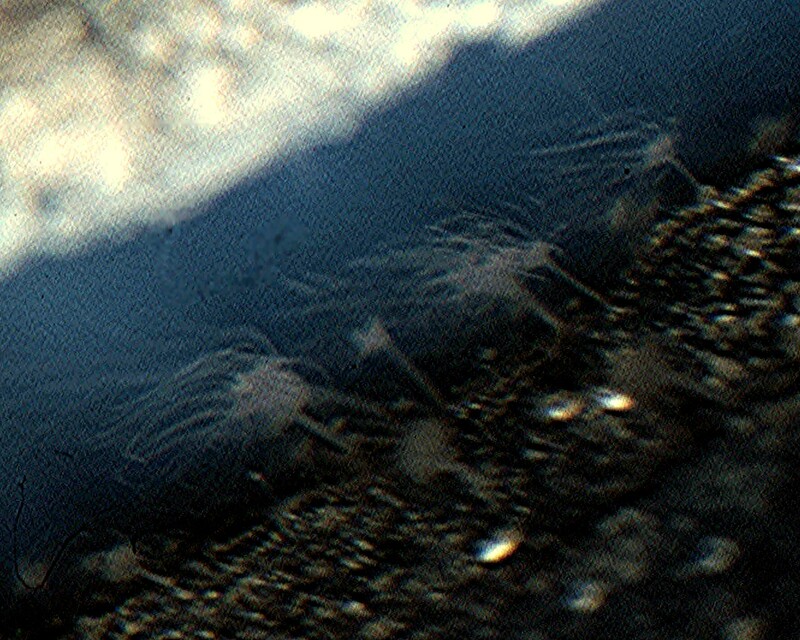 Unknown scyphistomae in my 1992 reef tank; these animals were found between two pieces of base rock where grazing snails couldn’t reach them. I could never find out what they were, but they did bud off the occasional small medusoid.. Unknown scyphistomae from my aquarium. Found behind a piece of PVC used to deflect water. 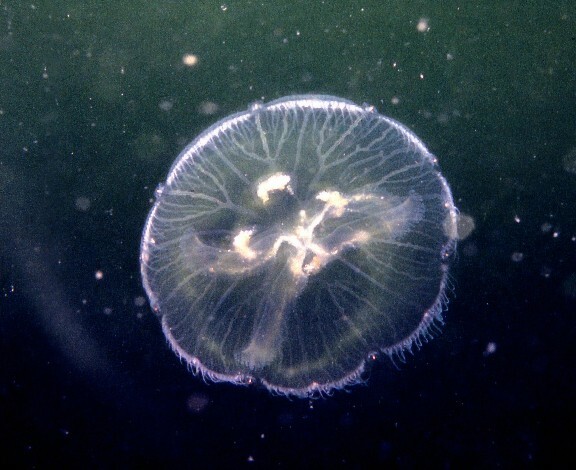 A population of scyphistomae of the moon jelly, Aurelia aurita. Moon Jelly, Aurelia aurita, from the Puget Sound region, about 15 cm (6 inches) in diameter. These jellies have been successfully maintained in aquaria, although it takes a lot of effort. 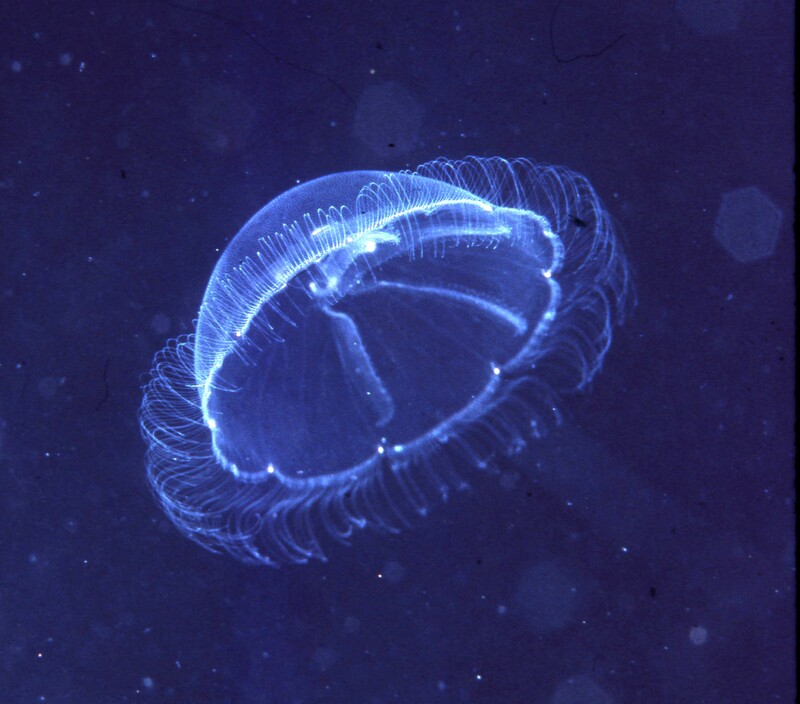 The moon jellies are a “species swarm”; there appear to be many species that are very similar in appearance but having different genomes. Aurelia from one of the jelly fish lakes in Palau/Belau. This animal was about 30 cm (1 foot) in diameter. May you be lucky enough to see some of the small medusae in your tank. VIDEO: So you want to start a reef tank? Oddities 03 - Pycnogonids, Underwater Tuffet Sitters?